On 28 oceanfront acres, Hotel del Coronado, Curio Collection by Hilton is adjacent to Coronado Beach and 5 miles (8 kilometers) from downtown San Diego. The hotel has cottages, a spa, restaurants, and shops. Lush lawns and gardens, along with its elegant ballroom, make this resort a popular venue for weddings and other events. The hotel offers 65,000 square feet of meeting space. A business center has computers with high-speed Internet access. The ocean-view Spa at the Del offers 21 treatment rooms, a sauna, spa tub, steam rooms and relaxation areas for men and women. Treatments include hydrotherapy, various types of massage, reflexology and waxing. Reservation is required for massages and spa treatments. The fitness center offers personal training by appointment. Del Beach, the hotel's private sandy beach, offers lounge chairs, day beds, and other services. One of the largest and oldest resorts on the Pacific Coast, Hotel del Coronado, Curio Collection by Hilton occupies 28 acres of oceanfront property at Coronado Beach, 5 miles from downtown San Diego. Recently renovated, the Victorian-era Hotel del Coronado, Curio Collection by Hilton offers pools, a spa/salon, fitness center, boat rentals, beach equipment and yoga classes, and children's programs. Guestrooms in the main original building have period decor, while Ocean Tower rooms have balconies and are more modern in style. They all have natural skin care and bath products by ESPA. Hotel del Coronado, Curio Collection by Hilton offers 679 air-conditioned accommodations, which are accessible via exterior corridors and feature laptop-compatible safes and safes. Beds feature premium bedding. Refrigerators and coffee/tea makers are provided. 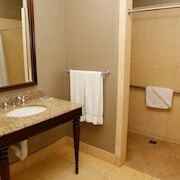 Bathrooms include shower/tub combinations, bathrobes, designer toiletries, and complimentary toiletries. Guests can surf the web using the complimentary wired and wireless Internet access. Premium cable television is provided. Additionally, rooms include complimentary bottled water and hair dryers. In-room massages and hypo-allergenic bedding can be requested. Housekeeping is provided daily. 1500 Ocean - Southland coastal cuisine made with fresh, regional ingredients. Impressive ocean view. Terrace bar and seating. Live entertainment nightly. Dinner only. Sheerwater - Fresh California fare. Oceanfront restaurant with exhibition kitchen and expansive outdoor terrace, heaters, and large fireplaces. Breakfast, lunch, and dinner. Crown Room - Offering an extensive and famous Sunday brunch. The arched, 30-foot-high Sugar-pine ceiling was built without a single nail. ENO - Wine room with 500 wine varietals, 35 cheeses from around the world, and local chocolates to sample. The Hotel del Coronado is hosting a free family beach party on July 1 from 7 PM to 10 PM for hotel guests to kick off the Fourth of July festivities early. All resort guests staying at The Del on July 1 are invited to celebrate right on the sand with a live band, recreational activities, s'mores, games for children and a spectacular fireworks show. On July 3, Coronado Island starts the celebration with the annual parade along Orange Avenue, featuring more than 150 bands, floats and groups. Then on July 4, the celebration continues with a fun run/walk, rough water swim, Art-in-the-Park and a concert in Spreckels Park. The day concludes with a spectacular fireworks finale over San Diego Bay.